A number of us are going to visit our friends for an Easter weekend lunch, so a big pudding was called for. This Eric Lanlard recipe is fairly simple and should look a little spectacular. Basically shop bought puff pastry with a frangipan and rum filling. 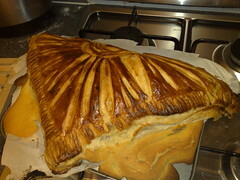 It’s a traditional French recipe which is eaten around Epiphany. So only a little late for us. I had two goes at making it. 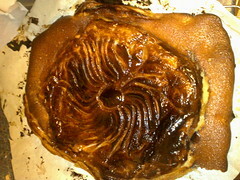 For the first, it was ever so slightly burnt, had a disappointing rise, and the filling leaked out. For my second attempt, I tried a different shape. 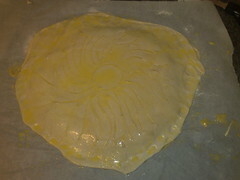 I still had a bit of leakage, but hopefully, most of the frangipane is still inside the giant pillow of puff pastry. 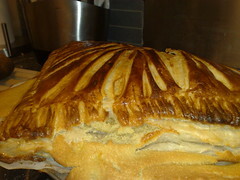 It came out of the oven enormous, but sadly sank quite quickly. Just how we’re going to transport that to Long Eaton tomorrow is another question! Frangipane: 125gr each of caster sugar, butter and ground almonds, creamed and with three eggs beaten in, along with a dash of dark rum. Roll the pastry into two squares the same size. Place a ring on the first and pour the frangipane in. Egg wash around the frangipane and remove the ring. 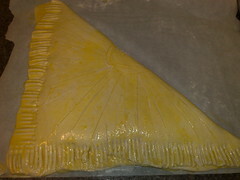 Put the second piece of pastry on top and seal tightly around the filling. Score a pattern on the top – sunrise or scallop or leaves. looks like pastry edges not well-enough sealed?? still looks very edible though!